I’ve seen some gorgeous designs lately using dark card stock and either gouache, which I don’t have, or pencils. Pencils it is, since I don’t own any gouache paints (yet). The poinsettia was heat embossed in black. Yes, I know. I seem to be obsessed that with poinsettia image. But, as you can see, there are so many options for working with it. Simple coloring with my Polychromos pencils, a bit of washi across the bottom and some letters I found in one of my embellishment drawers (don’t ask!). To finish it off, I’ve used some Distress Stickles for the center. Another fabulous day of tutorials from the ladies over at On-Line Card Classes. Loved Shari Carroll’s background technique, so that’s the one I went with today. A mix of old and new products today. I picked up this Stampendous poinsettia last week and think there are lots of ways to use it. Today it was heat embossed in Liquid Platinum and then I added some bling from an old Stampendous Frantage Encrusted Jewel Kit. There’s a lot of shine and shimmer that got lost in my photography, so you’ll just have to trust me on that “wink”. I used a new bit of Tim Holtz tissue tape for the sentiment. Love how the colors show through it! That’s it from me for today…back soon with more my friends! Welcome back to Day 4 of Verve’s March spotlight Hops! The Verve Divas and special guests are back for another day of spotlighting our new release! Everything previewed this week is available to order in the Verve online store. 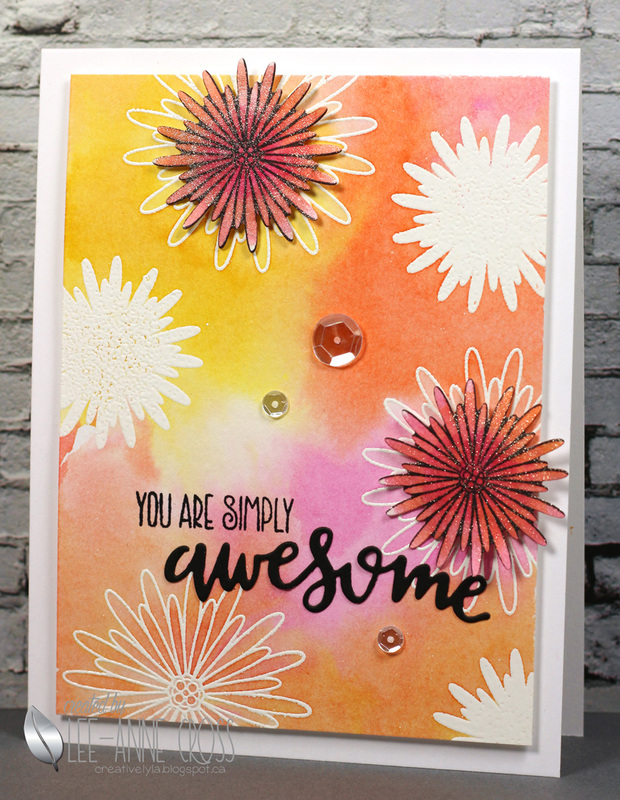 So come hop along and take a closer look at Simply Amazing, and the Simply Daisies and Amazing Adjectives die sets. I love working with watercolors! Just added three shades of Distress Inks to my watercolor paper and dried it. Then the fun begins 🙂 I’ve die cut the three sentiments from the Amazing Adjectives Word Die Set from my watercolored background and then cut them again in craft foam. Then they were layered and I added some Wink of Stella for some shine (that doesn’t show up in my picture!). Hope you’ve got your sunglasses on for this next one 🙂 I placed some Distress Inks on my craft mat and sprayed them with a bit of water, then I pulled my watercolor paper through the inks until the entire paper was covered. Next, I heat embossed the daisies in white. I die cut a couple of the smaller daisies with the Simply Daisie Die Set and colored them with my Zigs. Then for some added sparkle…lots of Wink of Stella. 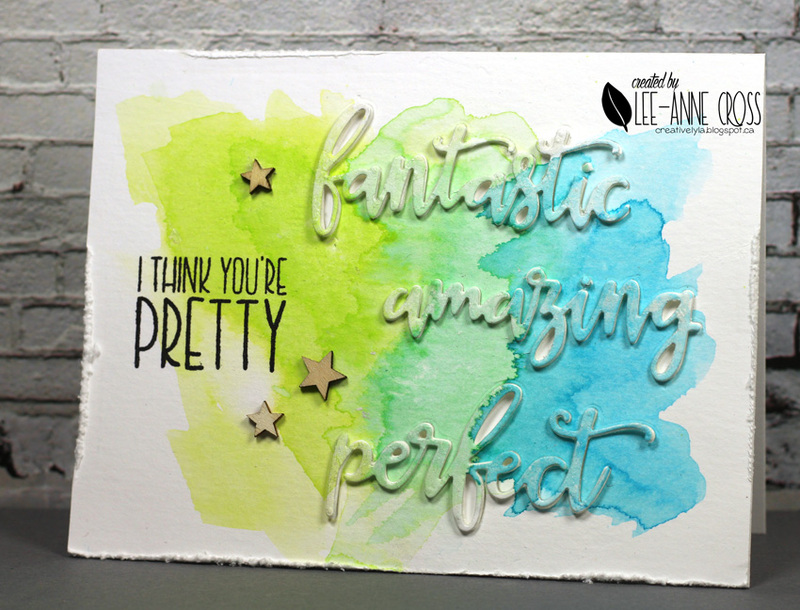 The sentiment is stamped and then I added the “awesome” die cut from the Amazing Adjectives Word Die set. A smattering of sequins and done!